These milkshakes in Gurgaon bring everybody to the yard, and we’re like, we’ve had them all. Without further ado, these are some of the best shakes you’ll find in G -Town. We can’t count how many summers have been spent at this café, our all-time favourite spot. The homemade shakes at Sakley’s can count on us as a friend for life. We’ve pretty much ticked everything on their menu off our list, but we have to say the Oreo Cookie Ice-Cream shake is ‘da bomb’ y’all! The pride and joy of this café is their “lickables” or freakshakes as we call them. A milkshake so big that you could make a meal of it, our favourite was the Magnum Upside Down shake, a heavily-loaded chocolate milkshake with delicious Magnum in it. It might not be a pocket-friendly milkshake but it’s loaded with all that good stuff, making it seriously hard to resist. This is a small, quaint café, best known for its breakfast, at which they do an amazing job! The same goes for their milkshakes. They’ve got three flavours – chocolate, strawberry and Oreo, but they do such a fine job. A book, chocolate milkshake and a quiet corner in their café – that’s all we really need. The monster shakes at Morello’s are the stuff of legends – this little gem serves some of the best shakes in the city! The shakes are loaded with all sorts of chocolatey and creamy goodness. Just as you’d expect, Their Ferrero Rocher with Nutella & Hazelnut is pure chocolate decadence. The legendary Keventers – how can one talk about milkshakes and not mention them? Keventers is basically milkshake royalty in this city. 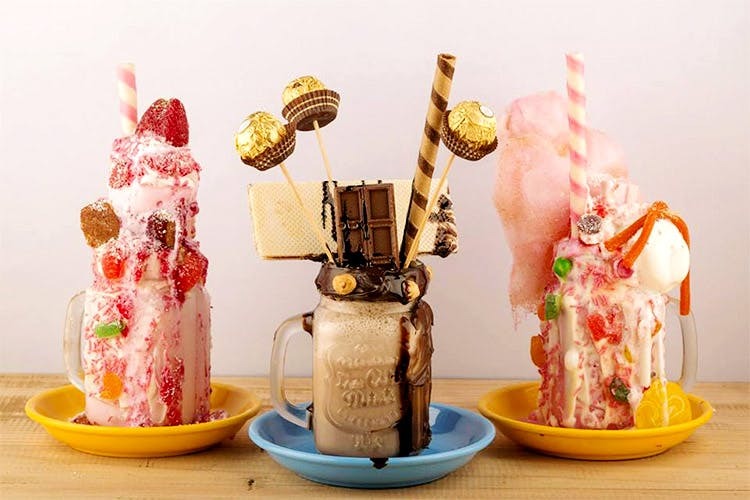 They’ve gone above and beyond their classic shakes like chocolate, strawberry and coffee and have thick shakes like Kit-Kat and Choco Peanut Butter and even some fruity flavours for those hot summer days.